Nearly any underutilized space in your home, such as a basement, garage, attic, extra bedroom or outbuilding has the potential to become the perfect Dog Room. The first step to any good design is to identify the problem and then determine how best to solve it. Start by creating a list of what you need and what you want. Remember, needs are things you must have, wants are those things you could live without. What might your needs be? Which activities do you and your dog do together? Are you already engaged in competitive sports such as agility or freestyle? 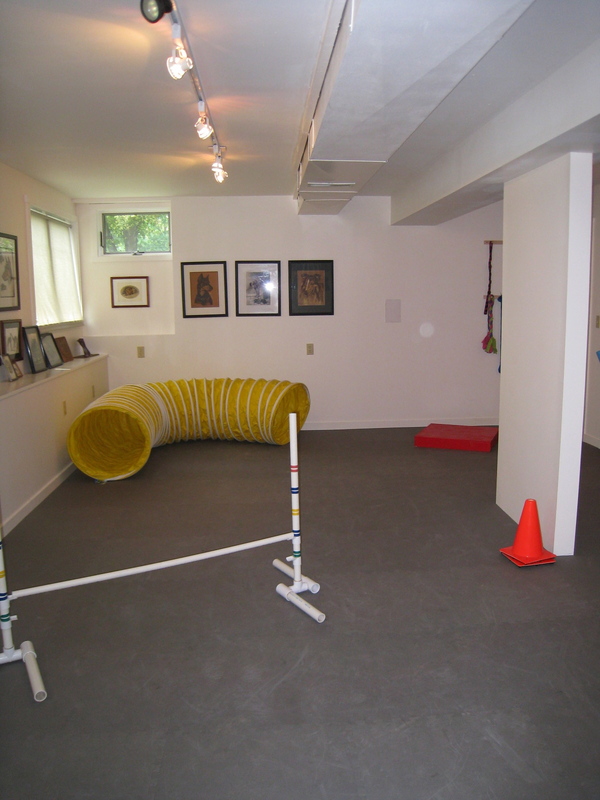 Or do you just need a place to bounce tennis balls off the wall for your active canine friend to catch? The list should include specific equipment or toys, and the design elements necessary to use and house them; such as storage, flooring and lighting. If the room needs insulation, HVAC or other building components add those to your list as well. If you have a semi-finished or finished space the project will cost much less than a new space or addition. Most additions will require professional help so add that to your budget as well. The size of the space will dictate how much you can physically do in the space, but don’t let the size be a hindrance. 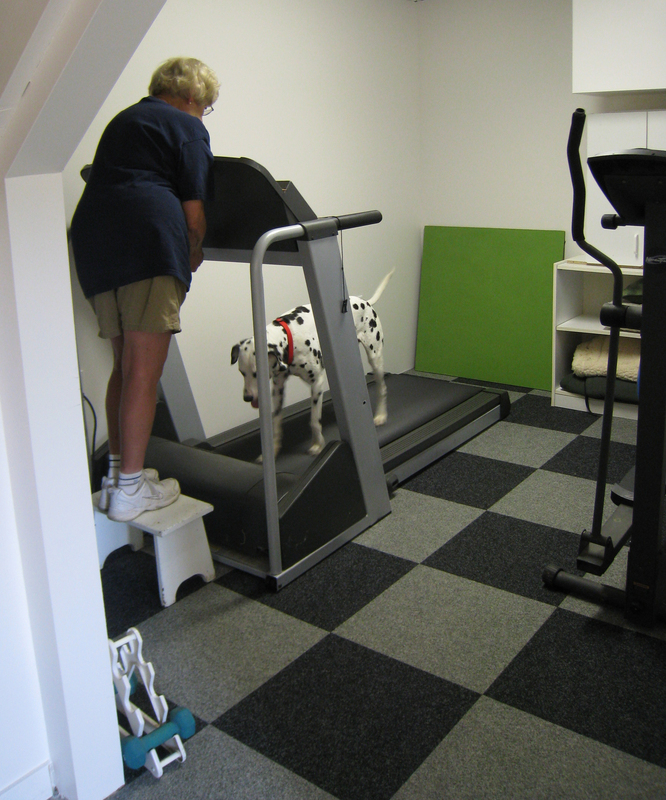 Many world-class agility competitors train in very limited space that may only allow for one obstacle at a time. The biggest concern in a space space for an active dog is the flooring. Non-slippery, flexible and durable flooring is crucial for your doggy playroom. Strenuous activities, such as jumping and running, must be done on a floor that flexes with your dog. Three types of flooring can serve this purpose for most dog activities and include: carpet, rubber and plastic foam. Be aware that some carpet can be slippery and may not provide adequate cushioning for jumping and running. I turned most of our basement into a dog training and play room. The base is a concrete slab that initially I covered it with modular carpet. The carpet was too slippery and did not provide an adequate cushion for my dogs so I covered the carpet with EVA (ethylene vinyl acetate) foam tiles. (See the before and after photos of the space above.) They are sold in interlocking tiles and work extremely well for this purpose. They are cost effective and very easy to install. I also created a small fitness room for the dogs and myself. 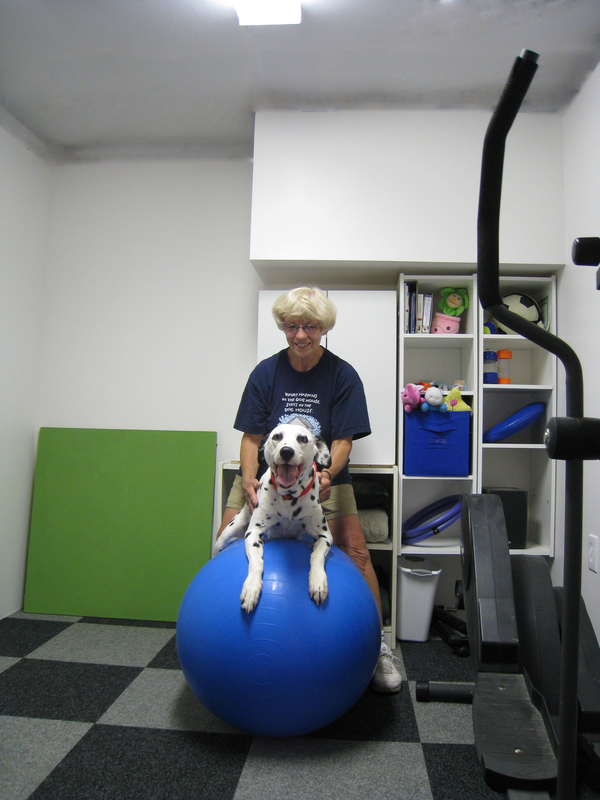 It has adequate room for a treadmill, therapy balls and other items for dogs and humans. (See the photos of Diane and Ambrose). 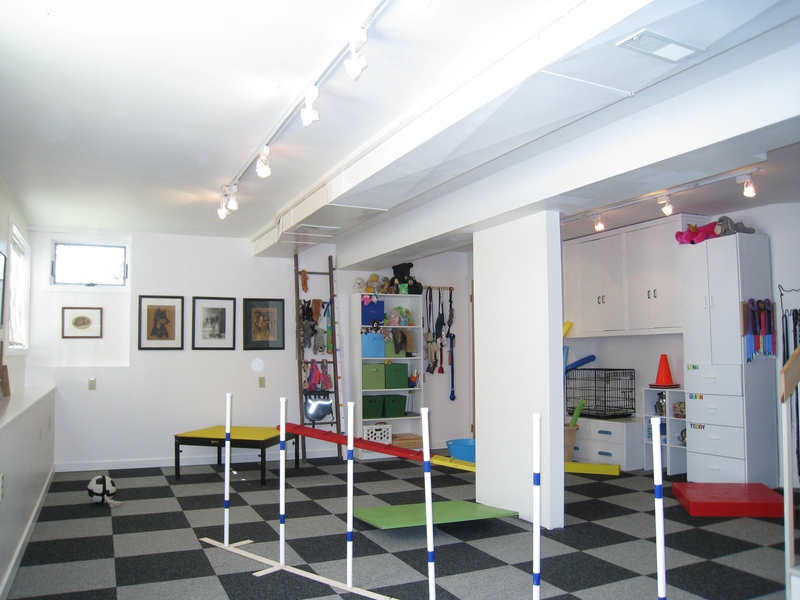 This entry was posted in Book, Building, Design Ideas and Projects, dog fitness rooms, dog rooms, dog training rooms, dogs, Interior Design and tagged Dog, dog play, dog rooms, Dog training, Training. Bookmark the permalink.